Ladies and gentlemen, I present to you my first ticket giveaway on this site! 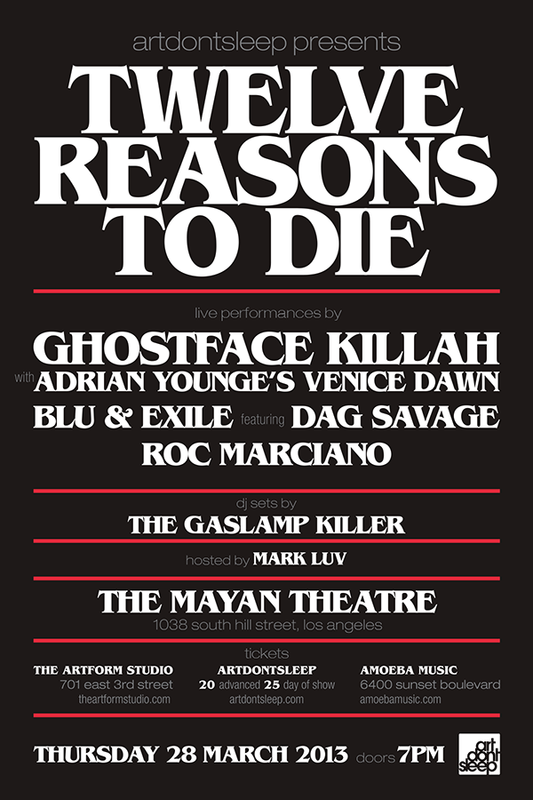 My friends at artdontsleep will bring Ghostface Killah and Adrian Younge to the Mayan Theatre in LA this Thursday where they will perform songs off their collaborative album, Twelve Reasons To Die. One lucky winner will receive a pair of tickets to the show. Shoot me an e-mail at afroxander@gmail.com with the subject line “Afroface Killah” with your full name to enter. Winner will be announced on Wednesday and also contacted by e-mail. 18+ only. This entry was posted in Music and tagged Adrian Younge, Ghostface Killah, The Mayan Theatre. Bookmark the permalink. Quiero ganarme los boletos!!! muy buena musica!! !